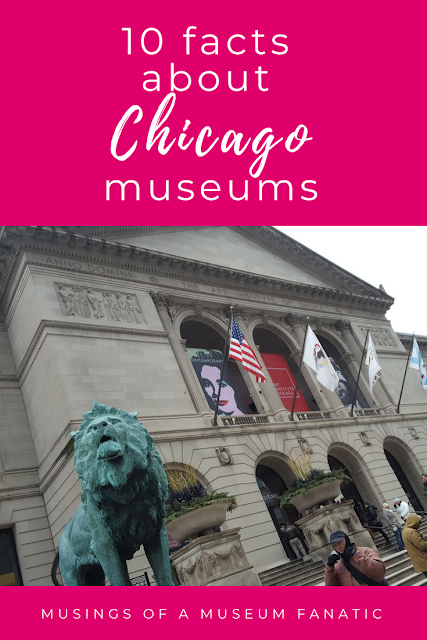 Since I'm off to a museum conference downtown for the rest of the week I thought I'd share with you some fun facts about Chicago museums! The Field Museum actually started during the World's Columbian Exposition in the Palace of Fine Arts, which currently houses the Museum of Science and Industry. The Art Institute of Chicago plays a big role in the cult classic John Hughes flick Ferris Bueller's Day Off. You'll find L car #1 housed in the Chicago: Crossroads of America exhibit at the Chicago History Museum. Every year the National Museum of Mexican Art hosts a Day of the Dead exhibit. Jane Addams Hull House Museum has a haunted history that involves a devil baby. In Rogers Park you'll find the Leather Museum and Archive which is the first museum in the United States that's dedicated to the history and subculture of the leather community. Indiana Jones' character is supposedly based on James Henry Breasted who was the founder of the Oriental Institute. At the Museum of Broadcast Communications you'll find some of your favorite Chicago personalities like Bozo and Svengali ... well at least their costumes!